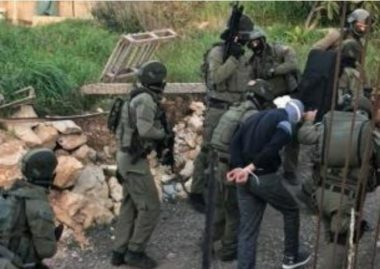 Israeli soldiers invaded, on Thursday at dawn, Hebron city and several surrounding towns, in the southern part of the occupied West Bank, violently searched homes, before abducting five Palestinians, including two siblings, and confiscated a car. Media sources in Hebron said the soldiers abducted Noureddin Mohammad Salhab and Eyad Naji al-Atrash, from Hebron city, in addition to Hamza Badawi, from the al-‘Arroub refugee camp, and Lu’ay as-Sa’ada, along with his brother, Mahmoud, from Halhoul town. The sources added that the soldiers conducted violent searched of many homes, causing property damage, and interrogated several Palestinians while inspecting their ID cards. Owners of some of the invaded homes have been identified as Adnan Abu Tabbana, legislative council member Mohammad at-Tell, in addition to former political prisoner Khaled al-Battat. It is worth mentioning that the soldiers also confiscated a car, owned by the Khaled al-Battat’s son. In related news, dozens of soldiers invaded Jenin refugee camp, in the northern West Bank city of Jenin, shot and injured four Palestinians, including three children, and abducted two others, during protests that took place after the soldiers stormed and searched homes.